Zipping up my wetsuit at the water’s edge I got the first of many chills. Probably from a mix of the actual weather and anxiety at the 10 mile swim I was about to embark on. “Ready?” he asks. I pull on my goggles and nod, shivering as I wade into the 50-degree water. 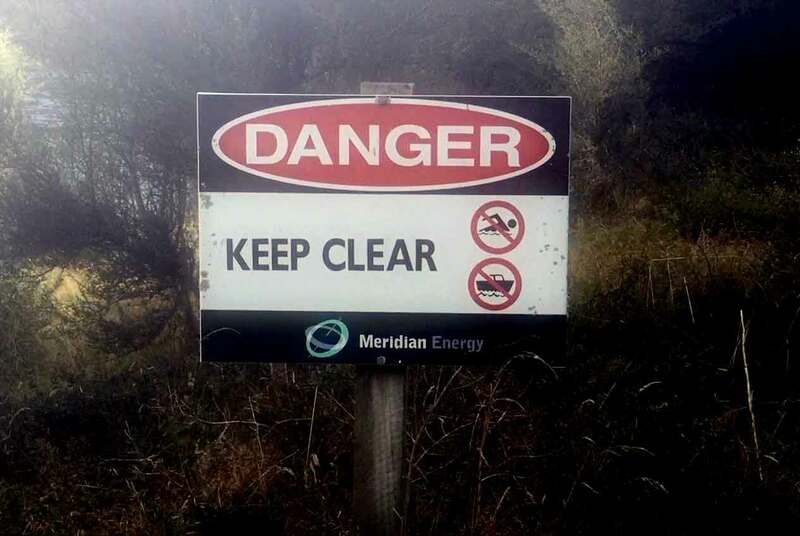 New Zealand has always been at the edge of adrenaline sports. This official tourism page lists all the ways you can scare yourself during a visit there. But few of them actually require much athleticism from the participant. Usually you just strap yourself into some apparatus and let gravity or the engine create lots of speed. Locals sometimes kayak down the stretch of the Waiau River (pronounced why-o) between lakes Te Anau and Manipouri in New Zealand’s Fiordland. With consistent flow rates, and mild class I and II sections, it is beginner paddler’s dream. The first several trips Andy took down the river were via packraft, and then eventually an inflatable SUP. It wasn’t long though before he hatched the idea of swimming. Before he moved to New Zealand, he’d developed a successful series of adventurous races based out of North Dakota – one of which was a downriver marathon swim. It was simply a matter of time before he convinced another local to try to swim the Waiau. The water is so clear I can see perfectly as the rocks speed by underneath my face. It is unnerving, feeling much shallower than the actual two meters, and I spend the first 10 minutes certain that I am about to scrape a hand across the rocky bottom, or worse – collide with one of the bigger rocks that suddenly appear in my vision. 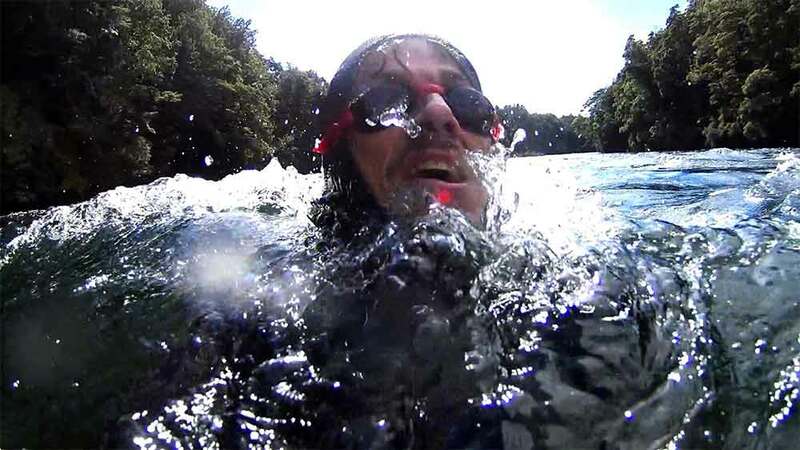 I’m used to speed on a mountain bike or skiing – but normally if I am moving this fast in water it’s because I have fallen out of my packraft and am desperately trying to get back in. It’s one thing to be floating down whitewater, buoyed by a PFD, head above the waves. Here I was swimming downstream headfirst (the biggest no-no in rafting safety) – adding my stroke speed to the already strong current. The surreal feeling of unease and disorientation was slowly replaced by giddiness and adrenaline. I was getting away with something that most of my senses (and common sense) told me was not a good idea. I can only imagine how intense that feeling must have been on Andy’s first swim here. Thankfully, he’d swam this river half a dozen times by now, and proved to be an excellent guide. “Big Rock Rapid coming up,” Andy said after tugging on my foot to get me to stop. We treaded water for a moment, and back paddled to slow down. “Stay a few feet left of that big rock, the channel is deepest there. It will seem like you will hit, but you won’t.” Andy dropped his head below the waves before I could ask how sure he was – leaving me no choice but to follow. The river miles flew by, and I lost all sense of time and direction. After swimming for over an hour, I was informed that we’d passed the last rapid, and the final obstacle was approaching: a strong cross current that could draw an unsuspecting swimmer into the low hanging sweepers on the left bank. Far less worried than I had been in the first rapids, I swam lazily ahead until I realized that I was being pulled sideways even as I stroked forward. I popped my head up to get my bearings, realizing I’d been swept nearly 50 ft away from my brother and was heading right toward the bank. I forced fatigue away and angled sharply back toward the river’s center. Unable to trust my senses in the shifting currents, I swam with my head up, Tarzan style, to keep visual sight of where I wanted to go. Andy has plans to petition the Department of Conservation to allow him to hold a downriver swimming race next summer. 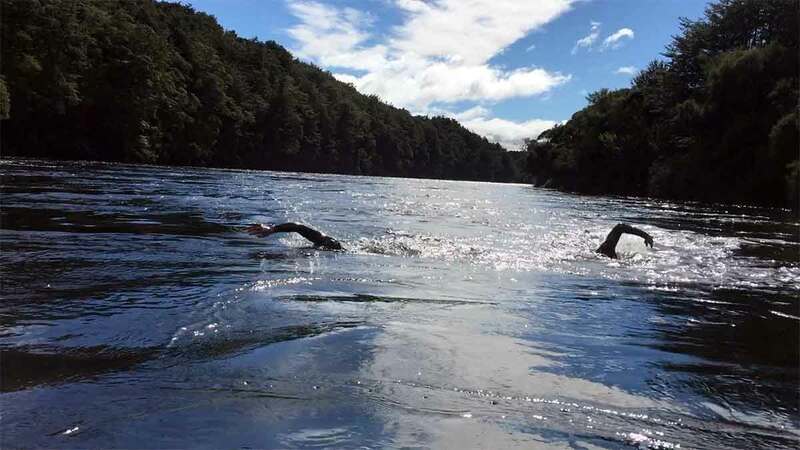 He’s also mentioned the idea of having head to head “border-x” style swimming races, where four competitors spring upriver at the same time, in an attempt to be the last one swept past a marker 100 meters downstream. When the swing bridge that marked out exit point came into view, I wasn’t ready to get out. We’d just swam 10 miles in 70 minutes. I’ve never run that fast in my life. Wobbly legs and a deep set cold set in as we stumbled out of the water and up the steep bank. Looking back over the river as it wound around the next bend. “What is it like further down?” I asked.